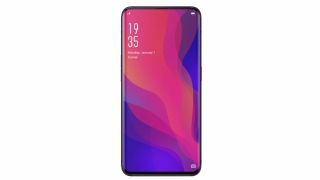 The Oppo Find X has been officially unveiled, with an impressive 93.8% screen-to-body ratio and a rather bonkers triple pop-up camera setup. Update: We had a chance to play with the Find X. Find out what we make of it in our detailed hands on Oppo Find X review. It directly challenges the Vivo Nex, itself only launched last week in China, which had boasted the best screen-to-body ratio of any smartphone at 91.24% and a single pop-up camera. The Find X however has both its front facing 25MP camera and dual 16MP and 20MP rear facing cameras built into one moving section which takes up the entire width of the phone at the top. Fire up the camera app, and the camera block rises out from the top of the phone to reveal its snappers. Back to the screen, and you're looking at a 6.4-inch OLED display with a full HD resolution. Thanks to the cameras (and various sensors) being hidden in the motorized block, it allows Oppo to get an excellent screen to body ratio with hardly any bezels. Under the hood you get a Snapdragon 845 chipset, 8GB of RAM, up to 256GB of storage and a 3,730mAh battery - ensuring that it's competitive with the other flagships on the market. There isn't a fingerprint scanner, so you'll need to rely on the Find X's face unlock if you want biometric security, and Oppo has also left off a headphone jack and wireless charging. You do get fast charging support via the USB-C port on the base of the phone, which lines up alongside a single down-firing speaker. There's currently no word on the Oppo Find X price, and the release date is yet to be confirmed, but what we do know if that it'll make it out of China, with a global release, including North America, already set in stone.